One of the last obstacles between Brett Kavanaugh and the Supreme Court seat for which he now seems destined has been obliterated by Senate Republicans. By a 51-49 vote, the Senate agreed to cut off debate on his nomination, and signaled that a final vote will likely come on Saturday. 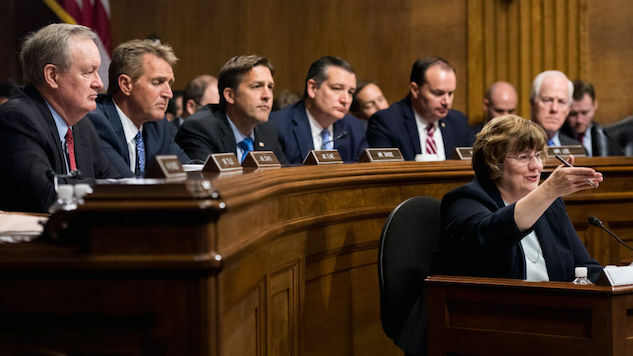 “I believe we’re dealing with issues right now that are bigger than the nominee, and how we ensure fairness and how our legislative and judicial branch can continue to be respected,” she said, choosing her words carefully, her voice filled with emotion. However, one Democrat—West Virginia’s Joe Manchin—voted “yes,” a mild surprise that he insists doesn’t guarantee his actual vote on Kavanaugh will be “yes.” That move kept Vice President Mike Pence from having to issue a tiebreaking vote. The final vote, it seems, will come down to Susan Collins (R-ME) and Manchin. If either one of them votes to confirm Kavanaugh, Republicans are guaranteed at least a 50-50 tie, which would be settled in Kavanaugh’s favor by Pence. If both stay on “no,” the nomination could be defeated. Collins recently described the FBI report as “very thorough,” and has said she’ll announce her intentions today at 3 p.m. She said that her vote to move the confirmation ahead didn’t necessarily mean a “yes” for Kavanaugh, but it would be an enormous surprise if she switched this late in the game.